2. Electric currents will return to their source BY ALL AVAILABLE PATHS. Normally in a 120V AC circuit, AC current flows from its source to its intended load on an energized, or “hot,” current-carrying conductor and then returns to the source on the neutral current-carrying conductor. In a 240V AC circuit, AC current can return to its source on the second “hot” conductor or on the neutral, or both, depending upon the combined nature of the loads attached to that circuit. A safety ground is not necessary to enable simple AC electric circuits to work, but is required by all fire and electrical codes throughout North America, and is always added, as a means to keep living beings safe from shock and electrocution. The neutral current-carrying conductor is held at ground potential by an electrical connection to the safety ground. Because it is connected to the ground, the neutral is also referred to as the “grounded current-carrying conductor.” The connection between the neutral and the ground – known as the “system bonding jumper” – is located at the “derived source” of the AC electric service. For shore power sources, that connection is ashore, in the “main service disconnect panel.” The safety ground conductor is intended to protect against over-correct faults; it is not intended to carry any of the current returning to its source in a properly connected and properly functioning AC electric circuit. A “leakage fault” current is an electrical current that returns to its source on an electrically conductive path that leads back to the source of AC other than the normal neutral return path. A “ground fault” is a specific type of “leakage current” in which there is an unintentional (often accidental) connection between the current-carrying conductors of a supply circuit and the safety ground of that supply circuit. On a boat, “ground fault” conditions (described in the article on Electric Shock Drownings, posted on this blog, here: https://gilwellbear.wordpress.com/category/boat-technical-topics/electrical-topics/boat-ac-topics/electric-shock-drowning/ and in an article on Ground Fault Sources, posted on this blog, here: https://gilwellbear.wordpress.com/category/boat-technical-topics/electrical-topics/boat-ac-topics/ground-faults-and-ground-fault-sensors/) can cause AC return currents to flow through the water to reach the shore-based infrastructure. This can be lethal to people, pets and wildlife in the water. 3) the total leakage currents in a circuit are cumulative. ELCI devices designed for use on boats are designed to be significantly less sensitive than are residential GFCI devices. Remember, they are not designed for the same purpose. Marine ELCI devices are designed to allow leakage currents of up to 30 mA and must disconnect the circuit within 100 mS. ELCI is a technology intended to protect equipment; it protects people only indirectly. These disconnect set-point threshold values are established as a compromise between the levels of AC current that may be hazardous to humans and animals, and the avoidance of “nuisance” trips that discourage adoption and use of the technology. I personally believe the simple act of installing ELCI on a boat will result in exposing many non-symptomatic legacy electrical wiring problems that currently exist in hiding, lurking, waiting silently to become apparent and dangerous as either leakage faults or ground faults. I think there are a lot of them. Some data suggest as many as 50% or the total pleasure craft fleet has them aboard. Boat owners should expect to find some, and consider themselves fortunate – or extraordinarily well prepared – if they do not. This statement includes newer boats, but especially applies to older boats. Non-complying equipment, like generator transfer switches selected for cost instead of capability and appliances and inverters not designed for marine installations, can introduce leakage current and ground fault connections. Wiring issues live and hide in both the on-board AC electrical system and in the boat’s DC system and DC bonding network. These faults can live in an electrical system for months or years, hidden and non-symptomatic. Another common non-compliance example occurs frequently on older boats. Many older boats will have neutrals and safety grounds mixed together, wired to the same common buss bar. Many boats with two 120V shore power circuits will have their neutrals connected to a common return buss. Many boats will have these problems – and others like them – from years of work having been done by unqualified people. These well-intentioned people may be modestly familiar with residential work, and are often able to “get it to work,” but are not qualified to correctly perform marine installations. Or perhaps, from attempts to use residential electrical equipment or materials bought at big box home centers or hardware stores that is not intended for use in marine applications. If the neutral and the safety ground are interconnected on the boat in a directly connected shore power configuration, a parallel return path is created in the safety ground return line with the infrastructure bond located at its correct place – at the “derived source” – in the shore-side infrastructure. In that case, some amount of current WILL return to the source, not in the neutral where it’s supposed to be, but on that parallel safety ground path (and, therefore, also through the water). That’s both a fire and safety concern. ELCI will detect that fault condition and trip the boat offline. If the neutrals of two 120V AC circuits are connected together on the boat, current from one source can and will return to shore on both neutrals, as long as they are both connected to the shore power pedestal, even of only one circuit is actually energized. 1. NEC Article 555 and NFPA Section 303 are driving marina and boatyard owners/operators to install ground fault detection circuit disconnect breakers (analogous to ELCI, except in the shore power infrastructure) on their 30A and 50A shore power services. That equipment has a higher yet trip set-point (100 mA, 100 mS) than ELCI. 2. These parallel paths represent shock and fire risks if and as connections age and develop high-resistance connections. Note as of June, 2015: There have been major changes relating to NEC requirements for marina, boatyard, condo docks, wharves, and other non private-residentence shore facilities to install GFCI devices on dock feeders. Please refer to my article on this emerging concern, here: https://gilwellbear.wordpress.com/category/boat-technical-topics/electrical-topics/boat-ac-topics/emerging-ac-electrical-concern/. What these changes mean is that boats with leakage faults or ground faults aboard will encounter loss-of-power situations increasingly more frequently, not less frequently. Imagine this scenario. You arrive just at dark at a marina fit with shore power leakage fault sensing equipment. You have a hidden, previously unknown and non-symptomatic wiring fault aboard your boat. When you connect to the marina shore power pedestal, expecting to shortly be enjoying dinner and an adult beverage, the marina infrastructure safety equipment disconnects the AC power to your boat. AND DEPENDING ON HOW THE MARINA DOCKS ARE WIRED, MAYBE TO OTHER BOATS AS WELL. That would not make your new dock neighbors happy! At a minimum, this scenario would result in you not having shore power at your boat for the duration of your visit. But worse, if you blow the dock service, you may well be asked to leave the marina. Yikes. Leave? Don’t we all know of marinas that’d be glad to throw us out to reduce their liability risk and the great dissatisfaction this scenario would bring to other customers? Equipment Protective Devices are, first, a technology that saves lives. They are not new, and are extensively used in industry and residential applications in many parts of the world. I RECOMMEND THE INSTALLATION OF ELCI, FOR EVERY ELIGIBLE BOAT, AS SOON AS POSSIBLE. Marine ELCI device specifications of trip threshold will accommodate all the cumulative permissible electrical leakage present in modern on-board electrical equipment. Getting an ELCI installed properly and working properly will expose any asymptomatic legacy problems aboard your boat. Correcting those issues will not only make your boat safer, it will foreclose cruising issues like that described above. Blue Sea Systems PN 3117, enclosure contains 2, 30A ELCIs. Looking at what’s available for the boater in the pleasure craft market today (1Q2013), Blue Sea Systems is the only marine manufacturer currently offering true RCD solutions for pleasure craft owner/operators. 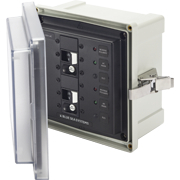 They offer single 120V (30A) and 240V (50A) units, and they offer a unit that accommodates 2, 120V (30A) circuits on the same boat in a single physical surface-mount enclosure. These units provide both over-current disconnect protection and ground fault leakage detection. They do require some available physical space for the installation. Because they provide over-current protection, they can replace existing over-current main disconnect breakers. North Shore Safety and Sensata Technologies have formed a joint-venture company, Techsol, through which they plan to market this complete ELCI solution via a distributor/dealer network. Techsol is not yet “up-and-running” in this venture. So today, it would be difficult-to-impossible for a pleasure craft owner/operator to obtain the components of this solution. However, this arrangement does appear to have space advantages over the RCD version from Blue Sea Systems, because the physical breaker and its enclosure can presumable be located remotely from the current transformer, in an available physical location in the electrical closet of the boat, where physical space may be more available. A boat with 2, 30A shore power inlets would need two pairs of these components, each to serve one of the two shore power inlets. Finally, it appears that some offshore (Canada, EU, Australia, South Africa, New Zealand) RCD devices may also meet the UL certifications required by ABYC E-11 for ELCI. One such product is a 40A, 120/240V, 50/60 Hz unit made by the French company, Legrand. Another is a 50A, 120/240V, 50/60 Hz device made by Hagar in the UK. Looking around the Internet, I also found other EU manufacturers in the RCD market. The web sites I found are generally quite technical, and often not suitable for boat owners without a skilled electrical background. In any case, I think it’s fair so conclude that the US marine market is not yet ready to serve the US pleasure craft owner/operator in this technology. I am continuing to research alternatives, and pursuing further information. Watch this space. For all of the rest of us, retrofit is not yet “required.” That said, don’t delay! If the Blue Sea Systems technology meets your requirements, proceed with that. ELCI IS AN EXCELLENT TECHNOLOGY, AND I RECOMMEND IT TO ALL BOATERS AS AN ELECTRICAL SAFETY ITEM! ESPECIALLY, I RECOMMEND IT AS SOON AS POSSIBLE FOR THOSE WHO BOAT PRIMARILY IN FRESH WATER, LIKE THE GREAT LAKES AND THE INLAND RIVER SYSTEM. Note 1: The nature of isolation transformers changes on-board wiring details. The ABYC E-11 electrical standard requires ELCI be installed on the current carrying conductors of the primary side of the isolation transformer unless the isolation transformer is within 10 feet (3 meters) of the shore power inlet. Furthermore, because the transformer secondary is an on-board AC “derived source,” the secondary neutral of the transformer is permanently attached to the “Main AC Grounding Buss” of the boat, as is the generator neutral. In this specific case, a generator transfer switch need only transfer the hot lines between the on-board loads and the transformer’s secondary or the genset. Refer to ABYC, E-11, 2012, Diagram E-5, page 36, for details. Note also, the referenced E-11 standard contains only one diagram showing a generator in an isolation transformer configuration, and that diagram depicts a 240V on-board configuration. It does, however, illustrate the intent of both on-board ELCI installation and proper neutral-to-safety ground bonding with an isolation transformer. Note 2: An excellent reference article on GFCI, ELCI and GFPE technologies can be found here: http://www.ecmag.com/section/codes-standards/differences-between-gfci-idci-and-gfpe. This entry was posted in Boat AC Topics, ELCI Primer on 2013/03/19 by gilwellbear.